Ford Motor Company confirmed today that the 2014 Ford Fusion will indeed be powered by a new EcoBoost engine measuring 1.5 liters but contrary to leaked information that we talked about yesterday that suggested that this new engine would be a 3-cylinder mill – the new 1.5L EcoBoost is actually another 4-cylinder option. After the leaked (incorrect) information it the web yesterday claiming that Ford would be putting a 1.5L EcoBoost 3-cylinder in the 2014 Fusion, Ford Motor Company issued a statement today clarifying that there would indeed by a new 1.5L EcoBoost in both the 2014 Ford Fusion and the foreign-issue 2014 Ford Mondeo but it would be another 4-cylinder engine and not a 3-cylinder as we had been led to believe by the leaked information. This engine will debut in the Ford Mondeo later this month at Auto Shanghai 2013, followed by the introduction to the American Ford Fusion after that while the European Mondeo sedans will get the engine last. Ford has not released any power figures for the new 1.5L EcoBoost 4-cylinder bound for the 2014 Ford Fusion but the company has commented that it will have similar power to the current 1.6L EcoBoost engine while offering better fuel economy. The 1.6L EcoBoost offers 178 horsepower and 184lb-ft of torque while Ford has already stated that the 1.5L EcoBoost headed for the Chinese market will pack 177 horsepower and 177lb-ft of torque so by suggesting similar numbers from the new 1.5L engine, Ford could either go with the 177 horsepower and 177 torque from the Chinese market or they could tweak this engine to equal the power of the 1.6L EcoBoost already on sale here in the US. The new 1.5L EcoBoost 4-cylinder engine in the 2014 Ford Fusion will differ a bit from the current 1.6L EcoBoost with a handful of features first seen on the 1.0L EcoBoost 3-cylinder. This includes an integrated exhaust manifold and a computer controlled clutch on a belt driven water pump – both of which will help cut down on warm up time thus reducing engine emissions and improving fuel economy. On top of those new features, the 1.5L EcoBoost 4-cylinder will include the same style of direct injection, variable value timing and – of course – turbocharging to make this engine powerful yet still very efficient. 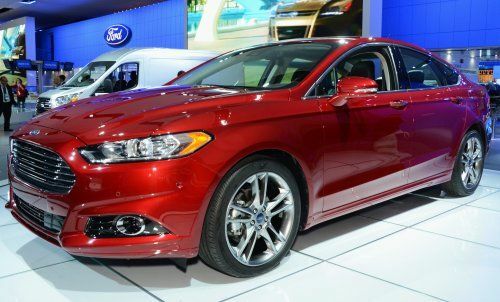 In addition to offering an unknown improvement in fuel economy, the 2014 Ford Fusion with the 1.5L EcoBoost 4-cylinder will offer a tax break to buyers who live in areas where vehicles with particularly small engines are granted such a break. For instance, in China those folks who buy a car with an engine measuring 1.5 liters or less receive a tax break and with the boom in the Chinese auto industry – Ford is acting quick to give buyers in that market a reason to think Ford first. "Ford EcoBoost technology has changed the way people look at gas engines and has enjoyed huge success with customers," said Joe Bakaj, vice president, powertrain engineering for Ford. "The new 1.5-liter unit further extends our EcoBoost promise of economical driving in terms of both fuel efficiency and – in some markets – tax savings." The new 1.5L EcoBoost engine will be built at Ford’s world-class facility in Craiova, Romania starting later this month and when it does, Ford Motor Company will have six plants around the world building EcoBoost engines will a total capacity of around 1.6 million engines per year. They will need all of that capacity as by the end of 2013, 80 percent of Ford’s global nameplates will feature at least one EcoBoost engine option.